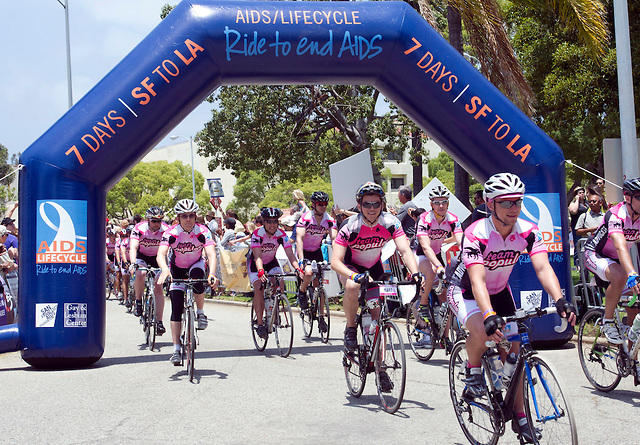 The week long AIDS/LifeCycle bicycle ride goes from San Francisco to Los Angeles and raises money for HIV/AIDS-related services. On Wednesday, the ride passed through Paso Robles and continued on in SLO County on Highway 46. At about 9:13 a.m., San Diego bicyclist Bryan Alvarado, 28, crashed on Highway 1 south of Highway 46 and suffered a broken clavicle. No other person was involved in the collision. A private vehicle transported Alvarado to Sierra Regional Medical Center. He was expected to be released later Wednesday. Less than an hour later, at about 10:10 a.m., 39-year-old Gregory Enriquez, of Valley View, was riding his bicycle westbound on Highway 46 toward Highway 1. Enriquez was west of the summit and Vista Point on a downhill section of Highway 46 when he rode over a solid white line with an embedded rumble strip. Enriquez lost control of his bicycle and was thrown over the handlebars. He landed in the westbound lane of the highway and was knocked unconscious. A CHP helicopter came out to the scene of the accident and airlifted Enriquez to Sierra Vista Regional Medical Center. Enriquez’s current condition is unclear.